WHILE the shores of the Atlantic from Nova Scotia to Georgia were being claimed and peopled by the British another and very different nation laid claim also to the mighty continent. Before Jamestown was founded the French had already set foot upon the St. Lawrence. Long before the Pilgrim Fathers sailed from Plymouth the flag of France was floating from the citadel of Quebec; and the French laid claim to the whole of Canada. But the French and the British claimed these new lands in very different ways. The Englishmen came seeking freedom and a new home. The Frenchmen came seeking adventure. The Englishman painfully felled trees and cleared land, toiling by the sweat of his brow for the comfort of a home. The Frenchman set up crosses on the edge of pathless forests, claiming unknown lands for God and his King. He came as missionary, trader and adventurer rather than as farmer. And, led on by zeal for religion or desire for adventure, he pushed his settlements far into the wilderness. So, long years went by. All along the Atlantic coasts spread fertile fields and fair homesteads. The British were content to live on the lands which they had cleared and tilled, and no adventurer sought to know what lay beyond the blue mountain range which shut him from the West. Far otherwise was it with the French. Priests and traders were both full of a desire for conquest and adventure. Many of them indeed were so driven by the roving spirit that they left the towns altogether and lived alone among the forests, tracking the wild animals, and only coming to towns to sell the skins and get provisions. These trappers brought back with them many strange tales of the forests and unknown wilds. They spoke of the Mississippi or "great water" of which the Indians told marvellous tales. And at length it seemed to their hearers that this great water could be no other than the long sought passage to India and the East. Many people, fired by these tales, went in search of this great water. Two priests named Marquette and Joliet were the first to discover it. * For many miles they floated down the Mississippi. On either side stretched endless forests and plains of waving grass, haunts of wild animals and of the Indians,–almost as wild. On they went, past the mouth of the yellow Missouri, on still till they came to the river Arkansas. At last, sure that the great river went southward and not westward as they had supposed, they decided to return. It had been easy enough floating down, but now they had to battle against the stream, and it was only after weeks of toil that they at length reached Canada again with their news. When he heard their story another adventurer named René Robert Cavelier Sieur de la Salle became eager to make certain of their discovery, and follow the river all the way to its mouth. With great care and trouble he made his arrangements. He thought it would be impossible to compass so great a journey by canoes, so he built a little ship which he called the Griffin. It was the first ship which had been seen by the Indians round Lake Erie, and in amazement and fear they came to stare at it. In their ignorant terror they would have destroyed it had not careful watch been kept. From the very beginning of his expedition La Salle found many difficulties. But at length they all seemed to be overcome, and he set out with his friend, Henri de Tonty, and about forty men. Tonty was a man of courage, as bold and enterprising as La Salle himself. He was, too, much feared by the Indians, who thought him a great Medicine Man. For while fighting in Europe he had had one hand shot off. But he had replaced it with an iron hand, which he always wore covered with a glove. The Indians did not know this, and once or twice when they had been troublesome he had brought them to order by knocking them down with this hand. Not knowing the secret of it they marvelled greatly at his strength, and, fearing him accordingly, called him Iron Hand. One of La Salle's great difficulties was lack of money. So before leaving the great lakes he collected a quantity of furs. Then he sent back the Griffin and half his men, with orders to sell these furs, and return with supplies for the expedition as quickly as possible. With the rest of his men La Salle journeyed on to the head of Lake Michigan in canoes. It was no easy journey, for storms swept the lake. The waves tossed their frail canoes hither and thither so that they were often in danger of drowning. They were harassed, too, by unfriendly Indians. At length, worn out by fatigue, starving with cold and hunger, they reached the appointed place to await the return of the Griffin. But the Griffin never came. In vain La Salle scanned the grey waters. Day after day passed, and no white sail flecked the dreary expanse. The Griffin was never heard of more. With a heavy heart La Salle at length gave up the weary watch, and decided to go on with such men and supplies as he had. But with every step fresh difficulties arose. La Salle had many enemies, and they did their best to hinder and hamper him. His own men were discontented and mutinous. They had no love for their leader, no enthusiasm for the expedition, and the hardships and dangers of the way made them sullen. They were half starved and worn out with fatigue; all they wanted was to get back to a comfortable life. They were sick of the wilderness and its hardships. Added to this the Indians told them bloodcurdling tales of the terrors of the "Father of Waters." It was a raging torrent of whirlpools, they said, full of poisonous serpents and loathly monsters. Those who ventured on it would never return. This was more than the men could face. They chose rather the possibility of death among the Indians and the wilderness to its certainty among such horrors, and some of them ran away. Depressed by this desertion La Salle resolved to camp for the rest of the winter. So on the banks of the river Illinois he built a fort which he called Creve-Coeur, or Heart-break. But La Salle's brave heart was not yet broken. And here he began to build a new ship in which to sail down the Mississippi. There was wood in plenty around, and the work was begun. But many things, such as sails and rigging, which were necessary for the ship, the wilderness could not supply. And, seeing no other way, La Salle resolved to go back to Fort Frontenac to get them, leaving Tonty meanwhile to look after the building of the ship. It was March when La Salle set out on his tremendous walk of a thousand miles. With him he took a faithful Indian guide and four Frenchmen. And seldom have men endured a journey more terrible. The spring sun was just beginning to thaw the ice and snow of winter, so that the prairies were turned to marshes into which the travellers sank knee deep. The forests were pathless thickets through which they had to force a way with axe and hatchet. As a pathway the rivers were useless to them, for the ice was so thin that it would not bear their weight. And later when it thawed and broke up they still could not use their canoes lest they should be shattered by the floating masses of ice. All day long they toiled knee deep in mud and half-melted snow, laden with baggage, guns and ammunition. At night they lay down without shelter of any kind. They were often hungry, they suffered constantly both from cold and heat. For at noon the sun beat down upon them fiercely, and at night the frost was so bitter that the blankets in which they lay wrapped were frozen stiff. The hardships of the journey were so tremendous that the marvel is that any one lived to tell of them. Indeed, one by one the men fell ill, and when at length after three months of pain and peril they arrived at their journey's end only La Salle had strength or courage left. Here more bad news greeted La Salle, for he now heard that a ship sent out from France laden with supplies for him had been wrecked. But even this cruel stroke of fortune could not break his spirit. Once more he set about gathering supplies, and made ready to return to Fort Heart-break. But worse was yet to come. La Salle was about to start when he received a letter from Tonty. From this he learned that soon after he had left nearly all his men had mutinied. They had rifled the stores and demolished the fort; then, throwing into the river everything they could not carry, had made off. Only three or four had remained faithful. With these Tonty was now alone in the wilderness. This staggering news only made La Salle more eager to set out, for he could not leave his brave friend thus helpless. So once more the toilsome journey was begun. But when Heart-break was reached, La Salle found no friend to welcome him. All around there was nothing but silence and desolation, and ghastly ash-strewn ruins. The unfinished ship, like some vast skeleton, huge and gaunt, alone bore witness that white men had once been there. Still La Salle would not despair. He spent the winter making friends with the Indians and searching earnestly for some trace of Tonty. The winter was unusually severe, the whole land was covered with snow and both La Salle and some of his men became snow-blind for days. But at last with the melting of the snows light and joy came to him. The blindness passed, Tonty was found. Once again the friends met. Each had a tale to tell, a tale of bitter disappointments and defeats. Yet in spite of all the blows of fortune Le Salle would not give in. Once more he set about making preparations for the expedition. But now he gave up the idea of building a ship, and decided to trust to canoes alone. It was mid-winter when all was ready. The rivers were frozen hard. So, placing their canoes on sledges, the men dragged them over the ice. As they went southward and spring came on, the ice melted and would no longer bear them. The stream was soon filled with floating masses of broken ice, so they were obliged to land and wait until it had melted. Then once more they set out. Every day now they drifted farther and farther into the heat of summer. The sun shone softly through the overhanging trees, the river banks were gay with flowers, and bright plumaged birds flashed through the sunlight. After the tortures of the past winters this green and fertile land seemed a very paradise. So on the adventurers passed where never white man had passed before; and at length they reached the mouth of the mighty river and stood upon the shore of the Gulf of Mexico. And here, while wondering savages looked on, this mere handful of white men claimed all the land through which they had passed for their King. The long silence of the wilderness was awakened for the first time by the sound of Latin chants. Guns were fired, and to the shouts of "God save the King," a pillar was set up. Then standing beside the pillar, drawn sword in hand, in a loud voice La Salle claimed the land for his King. 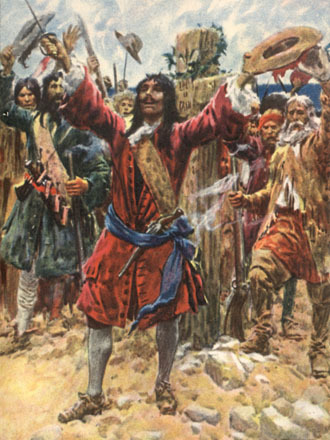 "In the Name of the most high, mighty, invincible, and victorious Prince, Louis the Great, by the Grace of God King of France and of Navarre," he cried, "I do now take possession of this country of Louisiana, the seas, harbours, ports, bays, and neighbouring straits, and all the nations, peoples, provinces, cities, towns, villages, mines, minerals, fisheries, streams, and rivers within the said Louisiana, from the mouth of the great river St. Louis along the river Mississippi and the rivers which flow there into from its source to its mouth." As La Salle ceased speaking once more the air was rent with shouts of "God save the King," and the thunder of guns. A cross was placed beside the pillar, a Latin hymn was sung; once more "God save the King" rang out upon the still air, and the ceremony was over. To France an enormous possession had been added. For La Salle claimed for France the greatest part of what is now the United States of America. Over all that lay between the Gulf of Mexico and the Great Lakes, between the Rocky Mountains and the Alleghanies the sceptre of Louis of France was stretched out. But such a realm could not be held by the mere singing of hymns and planting of crosses. La Salle himself had no idea how vast a province he had claimed. But even he realised that it could not be held by words and ceremonies. He had, however, his dreams of how it might be done. In imagination he built a great city at the mouth of the Mississippi. Upon the broad bosom of the river he saw vessels pass to and fro, carrying all the trade of Canada from north to south. And all along its course forts were built. These were to serve for trading stations and also as fortresses against the ever-encroaching British. Thus if his dream came true Northern and Southern New France would be united, and wealth and glory be added to the crown of Louis. So with his great plan in his head La Salle turned homeward. Many dangers and difficulties met him on the way. But through famine, sickness, treachery and many perils he struggled onward, and at length reached Quebec. From there he set sail for France, impatient to tell the King all that he had done, lay his great plan before him, and beg his help. Louis was quite ready to listen to La Salle. He gave him all and more than he asked. And before long La Salle once more sailed joyfully across the seas with a little fleet of four ships laden with colonists, and with everything necessary for the building of his city. Grace of God, King of France and Navarre . . . The plan was to sail direct to the mouth of the Mississippi and make a settlement there as the first step in La Salle's grand scheme. But from the beginning everything went wrong. On the way out La Salle quarrelled with the other officers. One of the ships laden with provisions and tools for the colony was captured by the Spaniards; another, filled with nearly all the remaining stores, was wrecked, and–worst of all–La Salle could not find the mouth of the Mississippi. Approaching it from the sea it was quite a different matter from sailing down from source to mouth. And coming to it from the sea La Salle could not recognise the place, and sailed some hundred miles beyond. When at length they landed the colonists were already dispirited, and they set to work to build their little town in a hopeless, listless fashion. Many fell ill and died; others wandered away into the forests, and were never heard of more. Misery after misery fell upon the settlers. Their numbers dwindled day by day, and at the end of two years scarce forty of the two hundred colonists who had set sail from France remained. Despair seized them all and their one desire was to return to France. But how? They were utterly alone, forsaken and forgotten. In vain they scanned the blue waters of the bay. No ship ever appeared. Of all the company La Salle alone remained cheerful and courageous. It was he alone who saved the others from utter despair. And at length, seeing no other way, he determined once more to take the long weary journey back to Canada, and bring help from there to the starving colony. So one January morning the forlorn little company gathered within the walls of the fort, and those who were to set out on the desperate adventure said farewell to those who were to stay behind and await their return. It was not easy to say whose lot was the harder. Words tender and sad were said, tears fell, and hand clung to hand, for a dread foreboding hung over the little company that they would never meet again. The last words were said, the last handshake given, and the adventurers trudged away on their long, long journey. They were a weather-worn, threadbare company, fantastically dressed in garments they had fashioned for themselves out of skins of animals, old sails and other oddments. Their clothes, though quaint, were serviceable enough, but their lack of boots was yet another misery added to the many which they had to endure on their long march. But in spite of every hardship La Salle remained undaunted and confident of success. Not so his men. Some of them, though not all, had grown to hate him as the cause of all their misfortunes, and now as day by day their sufferings grew greater, their hatred strengthened. At length there was mutiny in the camp, and one morning one of the mutineers, skulking in the bushes, shot at La Salle from behind and killed him. As their dead leader lay upon the ground the mutineers gathered round rejoicing. But their rage was not yet sated, and to show their hatred and contempt they brutally stripped the body naked, and left it to lie unburied among the bushes, a prey to wild beasts. Thus in misery and failure the life of this great pioneer ended. The mutineers now continued their journey, but they began to quarrel among themselves, and the ringleader was killed. What became of the others is not known. The few who had not been concerned in the murder journeyed on to Canada, which, after many adventures and hardships, they reached at length. From there they crossed to France to tell their woful tale, and beg King Louis to send help to the starving colony. But Louis would send no aid, and the colony of St. Louis was blotted out. Some time after La Salle left it was attacked by Indians. Nearly all were slain, and the few who escaped were scattered among the Indian tribes. Thus ended La Salle's splendid dream in the blackness of utter failure. But the failure was only for the time being. La Salle had given his countrymen a magnificent idea. He had pointed out the way to them, and others walked in it. * The Spanish explorer, Ferdinand de Soto, in 1641, came upon the Mississippi by accident probably somewhere near the boundaries of the present states of Tennessee and Mississippi, and after his death his followers sailed down to its mouth. But little came of his discovery, nor was it then connected with the great river which took its rise more than two thousand miles farther north.